When Sally Mundell’s husband, Grover, died 3½ years ago, she wanted to honor his last wish to teach children to give back to others. 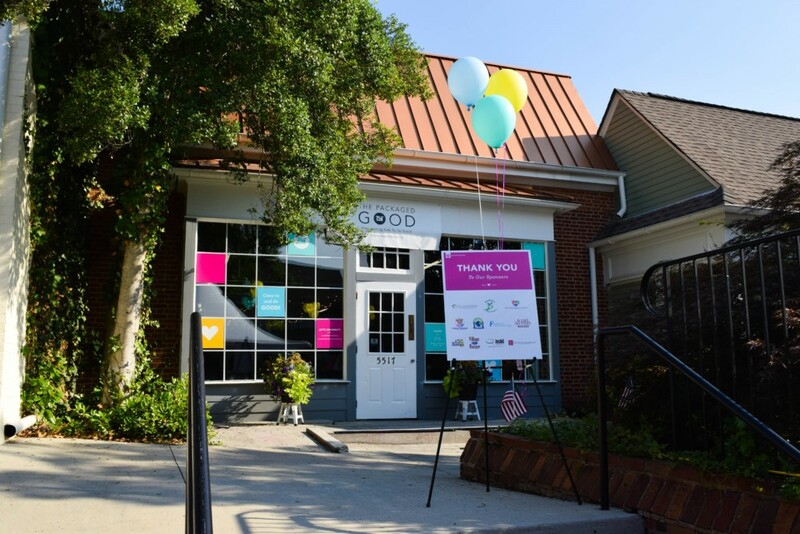 Mundell, a veteran of Spanx and a member of Temple Emanu-El, saw that dream realized with the grand opening of the Packaged Good, a not-for-profit store in Dunwoody where children and adults can color tote bags that are filled with toiletries and school supplies for people in need. Matilda and Ruby Mundell help their mother Sally Mundell, cut the ribbon outside the Packaged Good on July 2. After Mundell saw charity incorporated into birthday parties, the idea for the Packaged Good was born. She said everything she needed just fell into place. A test run out of her house was successful. The storefront of an art studio where she once took daughters Ruby and Matilda was vacant. Friends with careers in consulting volunteered to help. 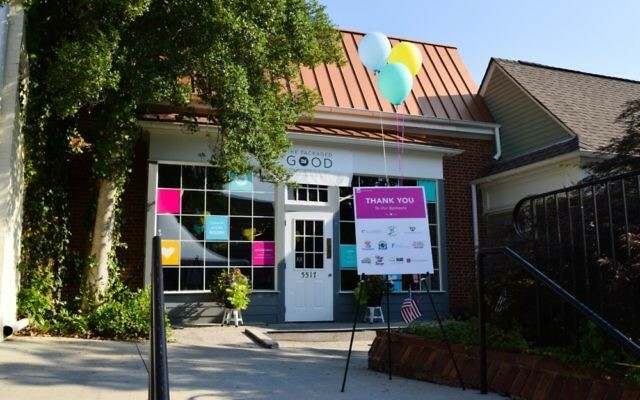 The Packaged Good’s concept is simple: using art to bring a smile to someone’s face while also giving that person necessities. 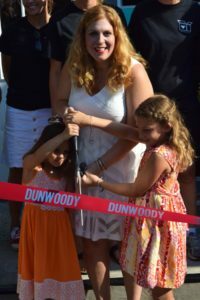 The store, at 5517 Chamblee-Dunwoody Road in Dunwoody, is set up with four pods, one for each featured recipient group: soldiers; senior citizens and lower-income nursing home residents; homeless adults; and children. A visitor to the Packaged Good colors a designed bag, then fills it with one of each item designated for the targeted group — toiletries for adults and back-to-school supplies for children. The bags are placed in a drop-off zone, where a volunteer network picks them up for delivery — except for the bags going to nursing homes. Those are delivered by children, who take the bags to each room and greet each resident. The Packaged Good completed 1,000 bags in the first month after its soft opening June 1, and an additional 600 bags were decorated and filled at the store’s grand opening Saturday, July 2. Mundell said she expects to exceed this year’s goal of 16,000 bags. People crowd into the Packaged Good to prepare bags with supplies for the needy. Drop-in hours, when anyone may stop by to create a bag, are Tuesdays from 9 a.m. to 2 p.m. and Saturdays and Sundays from 11 a.m. to 3 p.m. 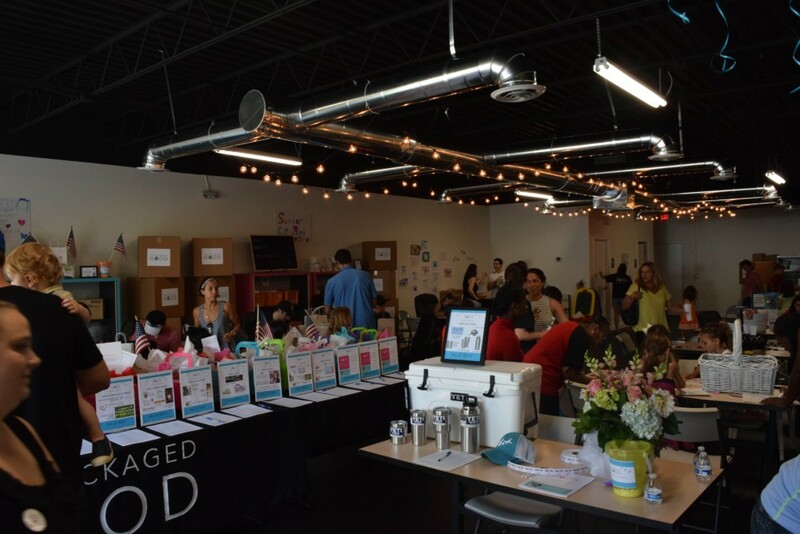 The organization also hosts special events for birthday parties, corporate volunteer days and moms’ nights out and for other organizations such as the Boy Scouts. One girl comes almost every weekend and hands out fliers to get the word out about the nonprofit organization.